Last week, I was able to watch First Love or Crazy Thing Called Love, a Thai teen movie. I initially didn't want to watch it because I had reservations with watching movies about teenagers-insecurities. LOL! I can't believe that its been 6 years since I was on the brink of leaving my teens behind. I got around to watching it after seeing the tagalized-trailer from ABS-CBN. 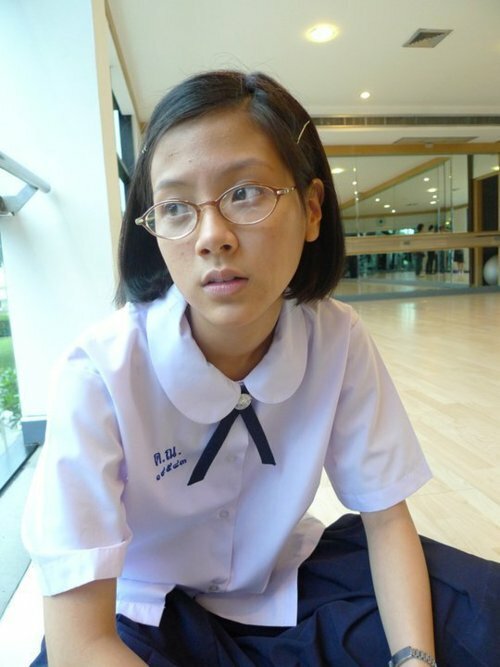 Nam, is in love with a senior named Shone. Because she looked like this, she and her friends seek out ways to get Shone's attention. Starting from leaving him gifts, studying harder, whitens her skin and eventually becoming the "campus crush". Much to her disappointment however, even if she had achieved that status, Shone remains elusive. I'm not gonna spoil out the entire story since some people who might drop by this little blog of mine might want to see the movie and discover the ending on their own. Kinda funny how her uniform reminds me of mine. This was our uniform at the university. Actually, I had more fun at the university. More fun than I did at Highschool. Life in Highschool was pretty much shallow. One day you have a set of friends, the next day they're gone. People were very much concerned with appearances, preferring Jansport bags made in the US rather than China although bought are purchased from the same store. Cheerleaders quarreling with one another over a set of common cheer routines and jocks strutting down the hall with their Nike Sports/Gym Bags. Of course there were times spent daydreaming with friends about the future, waiting for crushes to walk past and planning for prom dresses. Sigh! Moving on, Etude house is finally open! They have a stall in SM Davao and a boutique at the Abreeza Mall. They opened with a 20% off on all their items for one week. As a make-up junkie-here are my hauls. mascara off, Heroine's mascara remover does the job better. Also my family has been trying out Restaurants for the past month. Here is our latest find. We dined out at Hanoi Vietnamese Restaurant last week at their Abreeza branch and here's our feast-dig in! Ga Xao Hot Dieu - Chicken with veggies, cashew nuts, ripe mango, etc. Sisig-Filipino Food that we ordered. YUM!